Resolution of the 1997 SOLAS Conference relating to bulk carrier safety. The International Convention for the Safety of Life at Sea (SOLAS) is a global oceanic arrangement which requires Signatory banner states to guarantee that ships flagged by them follow least safety standards in development, gear and operation. 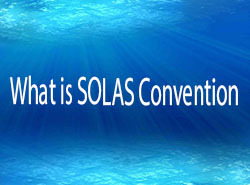 The present adaptation of the SOLAS Convention is the 1974 version, known as SOLAS 1974, which came into power on 25 May 1980. As at March 2016, SOLAS 1974 has 162 contracting States, which flag around 99% of vendor boats far and wide regarding gross tonnage. The SOLAS Convention in its progressive structures is by and large viewed as the most critical of all global bargains concerning the security of shipper ships.